Conservatives continued to outnumber moderates and liberals in the U.S. population in 2014, as they have since 2009. 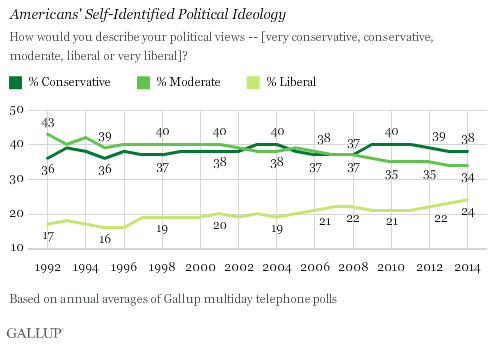 However, their 14-percentage-point edge over liberals last year, 38% vs. 24%, is the smallest in Gallup’s trends since 1992. The percentage of U.S. adults identifying themselves as politically conservative in 2014 was unchanged from 2013, as was the percentage of moderates, at 34%, while the percentage considering themselves liberal rose a percentage point for the third straight year. While not a huge number, this might contradict the idea that the Republican midterm victory was a sign of greater support for conservative views. I find this to be of limited significance as people tend to take more liberal positions on polls than would be expected if self-described labels had a real bearing on political positions. I have generally seen this poll to be more a measure of the demonization of the word liberal by the right wing noise machine than a measure of ideological beliefs, and perhaps this trend shows that conservatives are having less success in demonizing liberals. Another finding of interest is that, while 70 percent of Republicans label themselves conservative, only 44 percent of Democrats label themselves liberal. Is this due to a majority of Democrats not being liberal, or again due to people simply avoiding the term liberal? I suspect it is a combination of each, with the Democratic Party being a more centrist party, but also with many Democrats supporting liberal positions without using the liberal label. « Clinton v. Bush, Again?